An important aspect of Azure is that the IOPS and the throughput are limited by the VM series and size. The MS Azure Standard Tier A series A3\large VM is limited to maximum 8 disks with maximum 500 IOPS per disk. So, in theory a RAID 0 from 8 disks with 500 IOPS each could result in 4000 IOPS. Another very important aspect is the standard storage accounts are limited at 20,000 IOPS. 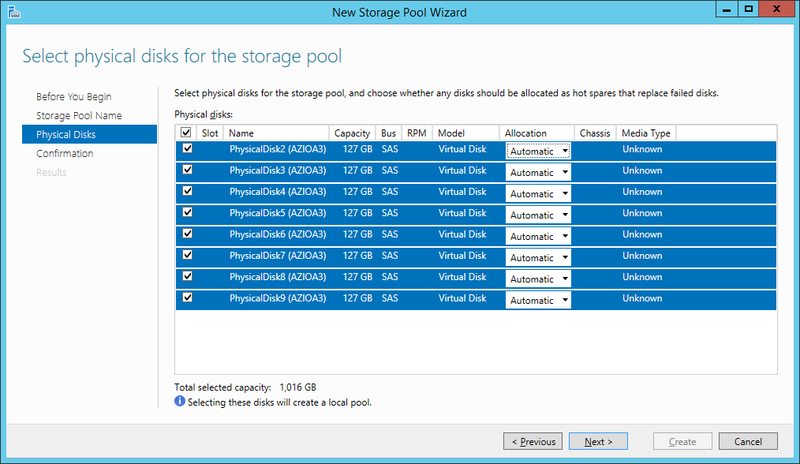 Standard Locally Redundant Storage is the cheapest Azure storage account type. 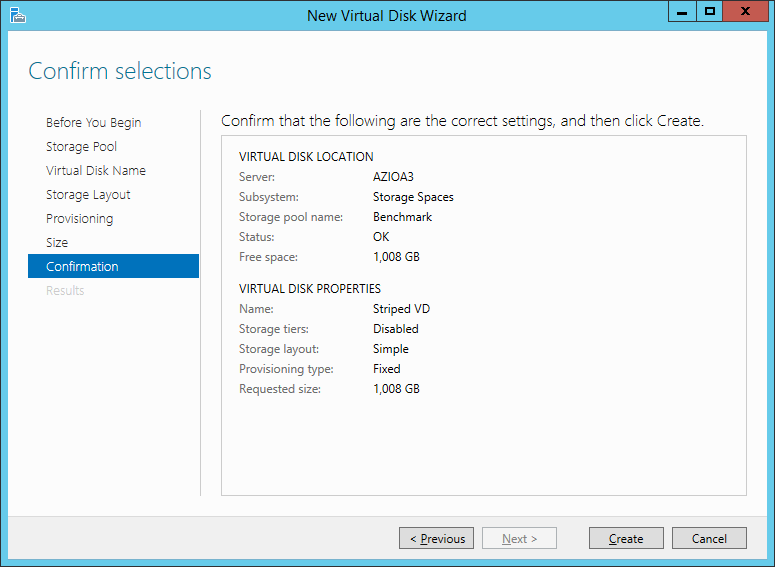 For this type of VM and storage, the default setting of the virtual disk host caching is set to None. The following PowerShell commands have been used to provision an A3 Standard VM with multiple (eight) disks hosted by Locally Redundant Storage (benchmark setup). The IOPS benchmarks are performed on the additional eight mapped disks (F volume will be a stripe of 8 x 127 GB disks). The aziostressdisks storage account will only host the eight additional virtual disks (F:\ volume) – so in this way the benchmark tests are not influenced by other workloads. In the above chart you can see the registered throughput. Very important to be noticed is the fact this time we register eight times the speed (≈32 MBps) we registered with a single disk (≈4 MBps). As expected the RAID-0 made of eight disks indeed improves the storage performance (32.06 MBps at 32.65 ms average latency). If we take in consideration the 20 ms recommended latency, we can see the throughput is not that close to the maximum registered value – which indicates clearly the limits are mainly caused by the physical storage (and not by the QOS limits applied by Azure). The above chart indicates the IOPS and average latency distribution across different workloads (# of Outstanding I/Os). If we take in consideration the 20 ms recommended latency, we can say whatever is higher than 64 outstanding I/Os (moderate workloads) will result in application performance degradation. As can be seen the average latency is growing (up to 287.47 ms) and gets outside the chart limits. What I find unexpected to these results is the fact the “8 KB; 100% Read; 100% random” and “8 KB; 50% Read; 50% random” benchmarks are actually providing better performance results at 16 Outstanding I/Os rather than 1 Outstanding I/O. Continue with Microsoft Azure IAAS – storage benchmarks, comparison with on-premises (part 4).